The Caribbean Fish Sanctuary Partnership Initiative (C-FISH) is a project aimed at strengthening community-based fish sanctuaries by providing resources, training and alternative livelihood opportunities in 5 Countries across the Caribbean. The C-FISH Initiative (£2.1 million) is funded by the UK’s Department For International Development (DFID) through the Caribbean Community Climate Change Centre (CCCCC) and is coordinated by The CARIBSAVE Partnership. The C-FISH Initiative was launched in November 2012 at the Belmont Fishing Beach Jamaica, where approximately USD$500,000 was committed in grants as part of the C-FISH Initiative’s objective to provide financial and technical support for the management of community-based fish sanctuaries. With this funding, three organisations (BREDS, BBFFS, C-CAM), which manage a total of five fish sanctuaries across the Island, were able to procure vessels that were much needed to improve the management and enforcement of their sanctuary. The Caribbean Coastal Area Management (C-CAM) Foundation which has the mandate to manage three sanctuaries in the Portland Bight Protected Area – Salt Harbour, Galleon Harbour and Three Bays – had been previously relying on a fishing canoe to conduct their patrols. “(For example,) we don’t have a boat. 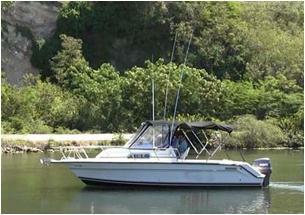 We don’t own a boat and how can you properly monitor fish sanctuaries without a boat? So we are trying to get a boat and hoping that somebody will give us the funds to do it or will actually give us a boat or an engine so that would allow us to do that,” (Ingrid) Parchment (Executive Director of C-CAM Foundation) reported in a 2011 article in the Jamaica Gleaner. 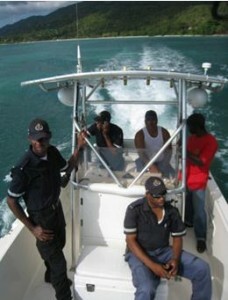 Since then, CARIBSAVE has provided enough funding for them to purchase a more adequate and fully equipped patrol boat. Five spear fishermen were arrested and charged for fishing in the sanctuary. One man in a kayak was arrested, his boat confiscated (and later returned) and fined $10,000 JMD. Two men were arrested, their net equipment confiscated (and later returned) and fined $3,000 JMD each. With a faster boat, the numbers of daily patrols have increased. The game wardens are especially grateful for the style of boat purchased since it has made performing the task of monitoring the sanctuary easier and more comfortable at all hours of the day and night. We have been able to catch significantly more fishers illegally fishing in the Bluefields Bay Special Fishery Conservation Area (BBSFCA) since January 2013. Additionally, the BBFFS hosted a fishers workshop, funded by the Environmental Foundation of Jamaica, on March 22, 2013 to educate local fishers about the importance and the laws surrounding the BBSFCA. Many of the fishers in attendance expressed the desire for the BBSFCA to be increased since they are now seeing an increase in their catch. Between the purchase of the new patrol boat and increased outreach, the game wardens are observing a greater level of compliance in the BBSFCA. The BREDS: Treasure Beach Foundation, which is responsible for the Galleon, St. Elizabeth fish sanctuary was approved for funding to construct a platform for enforcement and educational purposes. This locally-designed vessel is built upon two identical fishing canoes and will be placed mid-way in the sanctuary to give the wardens a floating base that provides full visual coverage of the entire sanctuary, thereby increasing enforcement effectiveness and reducing fuel costs. In addition to this, the platform can be used for educational tours of the sanctuary by schools, tourists and other visitors, allowing for more interesting and exciting learning opportunities, and greater awareness of the sanctuary. The new boat will also allow BREDS to undertake some income-generating activities, essential for the financial sustainability of the fish sanctuary. The platform being constructed for the Galleon, St. Elizabeth fish sanctuary. It will be placed strategically to improve enforcement, and can be used for educational and income generating activities. PHOTO: S. Lee | The CARIBSAVE Partnership. 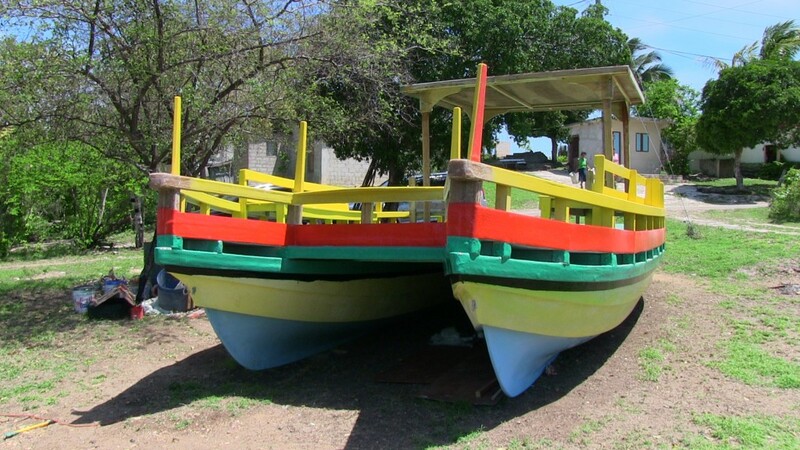 Additionally, The C-FISH Initiative is providing funds to the Sandy Island Oyster Bed Marine Protected Area (MPA) in Carriacou, Grenada, to employ local boat builders to design and construct a new and much needed patrol boat for their MPA. The C-FISH Initiative will also fund the construction of a catamaran-style platform for use in and around the Bluefields Bay fish sanctuary. That is, a total of 5 large boats provided towards strengthening the overall management as well as to facilitate income generating activities for sustainable financing of these community-based MPAs. Visit the C-FISH Initiative’s website to learn more about the project. By caribbeanclimate in Featured Project, News on June 7, 2013 .